This is by and far one of the most delicious celebrations of opposites you will ever put in your mouth! The sweet and the savory intermingled into an explosion of flavors that can only be described as "The Ultimate Fall Sammich". Yup. September is upon us and I am finally giving in to the impulse to actually bake again at home! All hail the Sweet Potato Bread! Fall Sweet Potato Bread is one that has been a classic here on the blog for many years! I served this sandwich variation at the Bistro regularly and it always had people begging for more! The slightly sweet soft spiced bread wraps around a tender herbaceous hunk of pot roast that is drenched in a rosemary gravy of glory!! 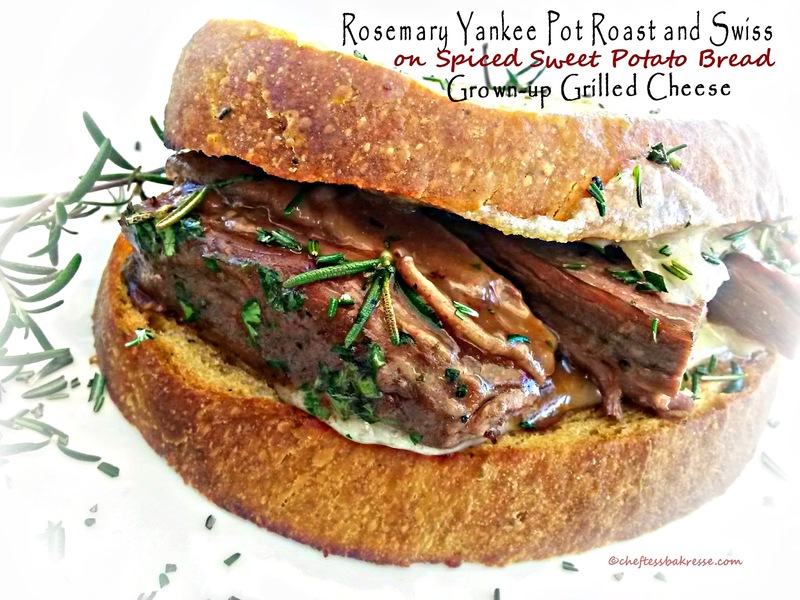 This post will be two posts in one...the Yankee Rosemary Pot Roast Recipe, and the Sweet Potato bread. That way you can decide if you want to just make the roast, or just the bread...but either way, be prepared for bliss! Season the roast on all sides by sprinkling with bullion powder and pepper over the entire roast. Sautee diced onion in a little oil until golden brown and set aside. Heat a Dutch oven on high heat and add oil. When oil is hot, place roast in pot and cook until browned on all sides. Add beef broth, cola, garlic, sautéed onion, and remaining teaspoon of salt. Bring to boil, stirring to release browned bits. Add tomato paste and stir. For crock-pot cooking method, transfer meat and juices to crock-pot and cook on high for about 4-5 hours (or until fork tender) or cook overnight in crock-pot on low heat. For oven method, cover Dutch oven and cook at 325 degrees in the oven for 3 1/2 hours. Liquid should be at least 1/3 of the way up the roast. Add more beef broth if necessary. At the end of cooking, sprinkle with fresh rosemary. The Sweet Potato Bread is my original recipe made in full in the Fall Sweet Potato Bread Tutorial with the embellishments and leaves. Here, I'm just giving you the recipe for the plain loaves. Add enough of the flour remaining to make a soft dough that is easy to handle but not dry. Turn dough onto a lightly floured surface and knead 10 full minutes. about 600 turns. Yea. 600 by hand. 5-6 minutes by machine on medium speed. Form into a ball and place in an ungreased 2 gallon bowl, covered tightly. If you don't have a large enough bowl...use two smaller bowls. Or...just half the recipe if you are worried. Put in the fridge. Punch down after 2 hours (this may be faster if you use warm ingredients or flour. If the dough is over 85 degrees when you put it in the fridge, be sure to punch down sooner. Also...if you have kids who open the fridge a lot, be sure to lower the temperature a bit so that your fridge is really as cold as it should be) Form into a ball again. Cover tightly and chill at least 8 hours. Place on a parchment lined baking stone or baking sheet, at least 12 inches by 10 inches. Allow to raise until doubled, uncovered, lightly misted with water. When almost raised, turn on the oven to 425 degrees. Bake 425 degrees 15 minutes and lower the temperature to 350 for the final 15-20 minutes of baking. Allow to cool. Slice and wrap tightly. To make into the Yankee Rosemary Pot Roast and Swiss Grilled Cheese simply place a slice of the warm pot roast and 2-3 slices of Swiss cheese on a thick slice of the sweet potato bread. Grill on the stove in a medium skillet over medium heat with melted butter until golden and toasted . Garnish with minced fresh rosemary if desired. A wicked sandwich for Fall! This bread is one of my all time favorites..My mouth is watering just thinking about this sandwich!